There's an iPhone app aimed at those in the QSR (Quick Service Restaurants) industry who need to keep tabs on or track the efficiency of their (or their competitions) drive-thru performance. It's called the Fast Food Timer. It could also be fun for those app-happy fast foodies out there with nothing better to do with their iPhone or iPod Touch while sitting in the drive-thru. 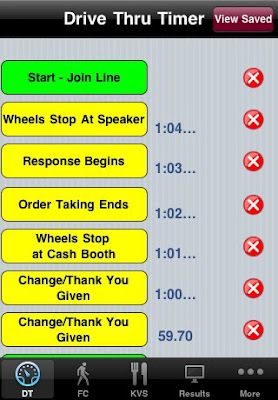 Fast Food Timer was developed for the QSR Industry. This app is for all the Business Consultants, Owners, Supervisors, managers, A-crew and Secret Shoppers (or anyone else!) that wants to Observe, Analyze and Improve the speed of service at any QSR location. This app can be adapted to or for many locations. While preparing for an inspection I looked at the app store for a timer and found this one, wow! DT KVS and front counter timed like it was written by corp for their consultants. It deliveres on everything it promises. Still looking for good ideas to add to this app to Make it more useful. Here are a few promo codes for people to try the app.